Gimme de homemade wine, it nice. 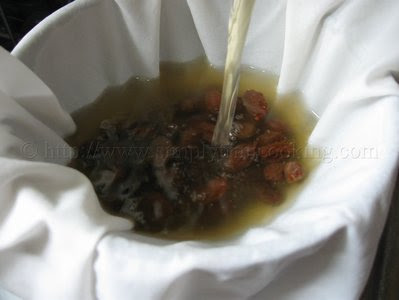 Just like Scrunter’s song, “Homemade Wine” celebrates homemade wine making in Trinidad and Tobago which is an art in itself. And a delicious one at that too! From recipes scribbled on a copybook page or passed on by word of mouth, to possibly closely guarded secret ingredients or techniques, making homemade wines using our local fruits, plants, barks and flowers is a treasured pastime. Wine from plants, barks and flowers??? Yep, that’s right. 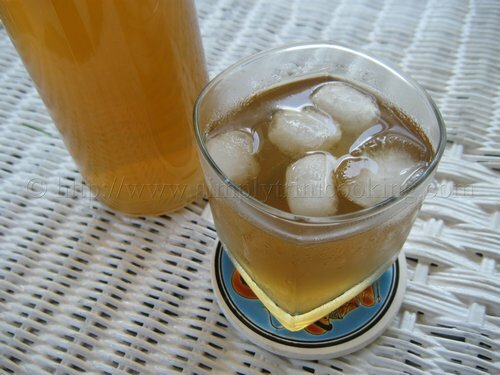 We have taken plants like the famous Chadon Beni (Eryngium Foetidum), Aloes ( Aloe vera), Timarie ( Neptunia Aquatica ), the aphrodisiac bark Bois Bande ( Roupala Montana ) and even Hibiscus flowers to make wine. 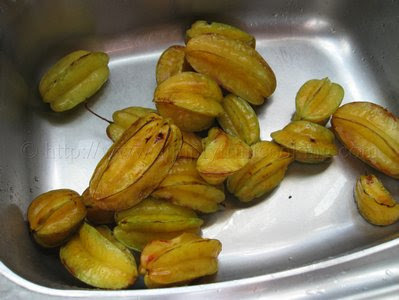 Personally, I haven’t tasted the chadon beni and timarie but common ones like guava, passion fruit, cashew, cane, rice etc I have had at one time or another while house paranging, at a lime or from friends…. 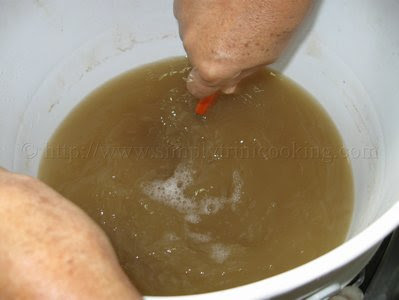 I even heard of some people using dasheen to make wine….in fact I think we Trinis could take almost anything to make wine LOL!! 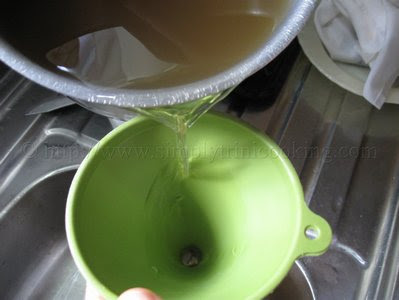 Anyhow, today I’m going to show you how to make five finger wine. From the looks of it though, you could substitute the five finger with any other fruit and make any other type of wine as well. 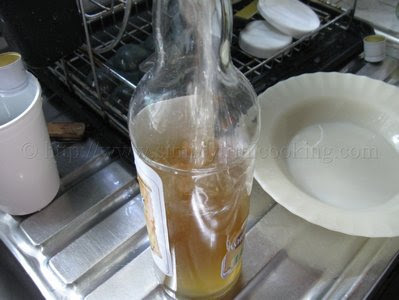 The steps are simple to follow; just make sure everything is sterilized with hot water. 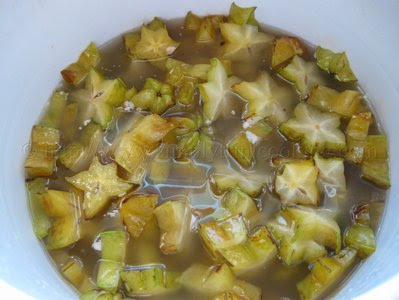 Here’s five finger ( carambola, star fruit) wine. Enjoy the fruitiness! Add the five finger to the water in a bucket. Note: We used what we call a “pigtail” bucket to set the wine. 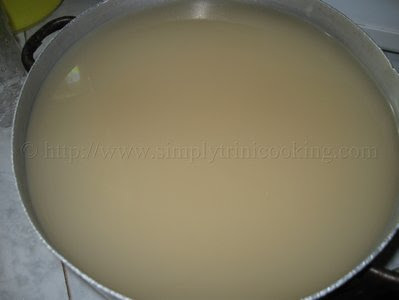 The water was boiled and cooled beforehand. 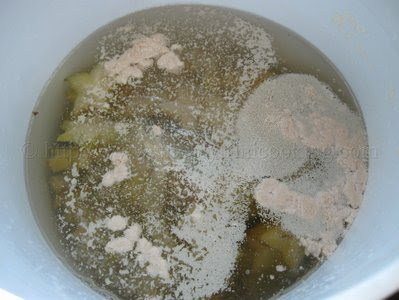 Add the yeast and 6 lbs sugar and stir. 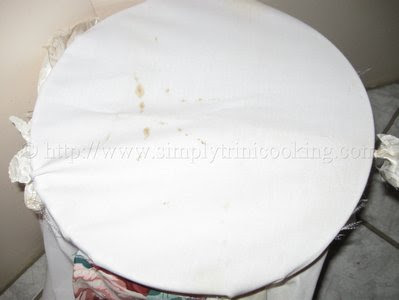 Cover the container and leave in a cool dry place for 21 days…. Ok 21 days has passed….Well at least pretend 21 days has passed LOL! …. This is how the five finger looks now. 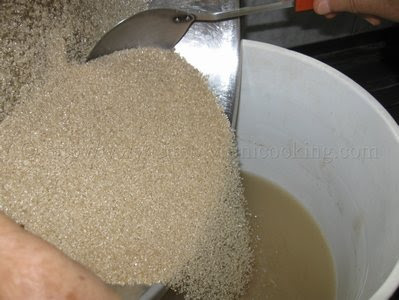 Pour out and sweeten the wine with the remaining 6 lbs of sugar. 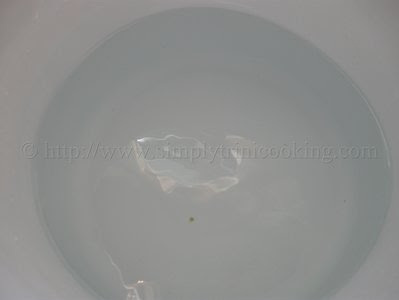 Note: Make sure everything is sterilized in hot water before use. 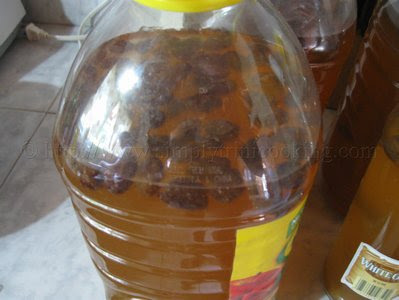 Pour out in sterilized bottles add raisins and leave for ten days. Note: Adding the raisins and leaving for the ten day period helps make the wine clearer. DO NOT COVER THE BOTTLES TIGHTLY. After the ten day period strain the wine again. 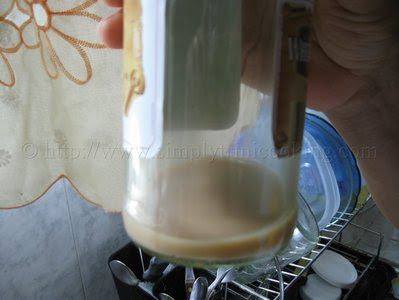 This picture shows some of the impurities (dead yeast) that settled at the bottom of the bottle. 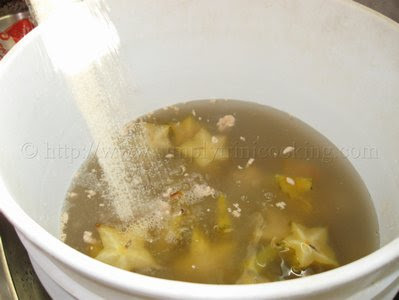 Ok before I go I would like to leave you all with the song “Homemade Wine” by Scrunter….See how many types of trini homemade wine you could name ! 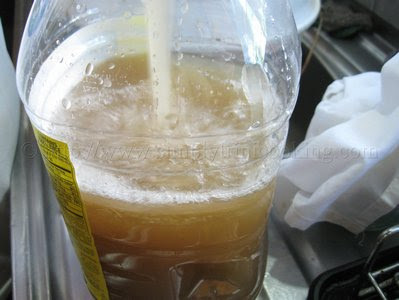 what other types of wine do you make in trinidad? 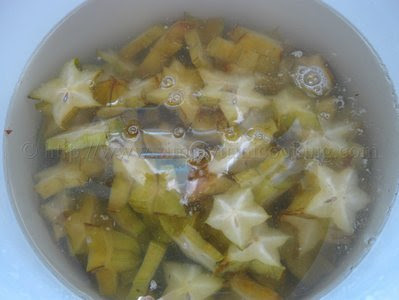 As I have said before, we take almost anything to make our wines even down to aloe vera! Can sorrel be used to make wine? Ever heard about Ganja wine? Yes and yes lol!! But you know between you and me I can’t post Ganja wine lol!! Felix, you wrote that you can make any other kind of wine using the basic recipe. But I have a question, to substitute the fruit, would you do it by amount or by weight? So would I use a pound or two pounds of aloes, or a pound or two pounds of guava, or a pound or two pounds of pineapple or a pound or two pounds of raw rice? Wonder if I am asking this question correctly? Thanks for the comment. I believe I understand what you are asking. 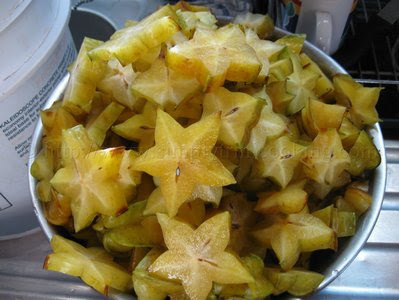 If you wish to substitute the 25 star fruit with any other fruit it would be equal to about 5 pounds. So I guess you can go ahead and use an equivalent amount of 5 pounds for the fruits. You know, I have always wanted to try guava wine. 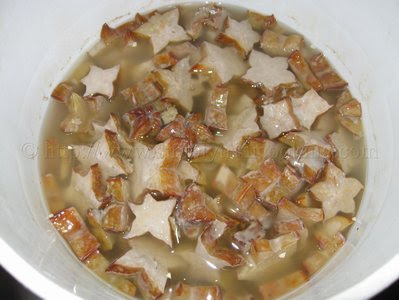 I find the perfume of guavas really delicious. There used to be a guava tree in Woodbrook some years ago. Every year it was something to smell the perfume when the fruit was in season. Then they cut it down. Very sad day. Oh well. Thank you for your guidance on this! hi. 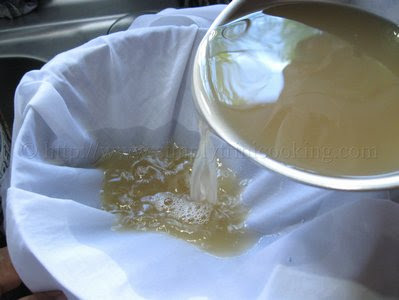 is it normal baking yeast that is used?